Buy the Farm . . . Share: Going Bananas! It is fortuitous that Jen happened to take this trip in the 21st week of her pregnancy. According to the Baby Size Chart, our two babies are now the size of bananas! Jen hates bananas so it worked out rather well that she was not around to have to endure this week's themed meal. 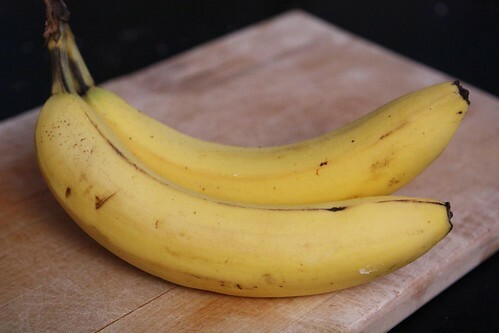 It seemed a little strange that they are the size of bananas this week. Last week they were the size of cantaloupes. I have always considered the average cantaloupe to be larger than your garden variety banana, however, the Baby Size Chart is not to be questioned. Do not question to the chart! 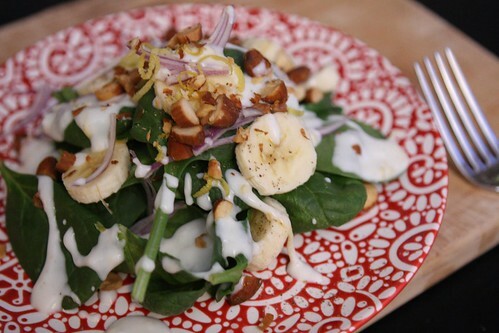 I started off by making this salad with baby spinach, banana, red onion, lemon zest, roasted almonds, and a dressing made of yogurt, buttermilk, salt, pepper, lemon, and honey. This was surprisingly tasty. My worries of going banana crazy tonight cooled a bit at the taste of this, though I'm sure the phrase "banana salad" is still not going to achieve the status of "goat cheese and cranberry" any time soon. 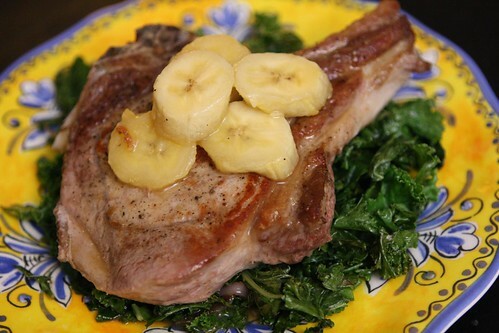 For an entree I seared a pork chop and finished it in the oven. I cooked down some kale and red onion in a little olive oil, salt, and pepper, then made a sauce of orange juice, brown sugar, and banana to put over the top. This was also shockingly tasty. As a big fan of well-cooked pork chops (and by that I mean cooked perfectly, not overcooked) this was a pretty easy win for me. For the first time in weeks I've found an appropriately produce-themed beer to accompany my baby theme meal! The beer was this Banana Bread Bear from Wells and Young's Brewing Company in the UK. This is the first beer I've had that looks designed to revolt both Jen and my father-in-law. While interestingly unsweet in the first few sips, by the end I found it to be a little tiresome. It had a distinct-but-subtle fresh banana flavor but by the end of the beer I felt as though I had just eaten some banana-flavored Now & Laters. 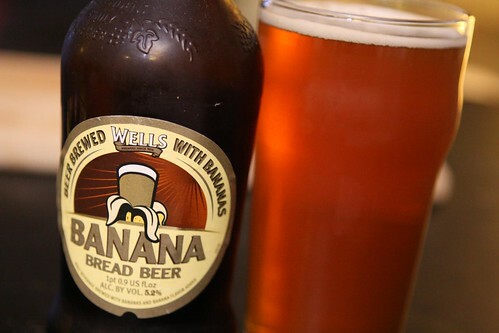 It seemed a bit odd to have dessert after such a beer but if I made a salad, entree, and beverage that were all banana-themed then it seemed like I would have been letting a golden opportunity slip away by not having dessert. I don't think I've ever actually had a banana split before in my life. At least I don't recall ever having one, despite frequent trips to the ice cream parlor every summer of my youth with my father. While I was tempted to jazz this up in some unusual way I figured my first taste of this treat should be the classic. I just used vanilla ice cream, made some chocolate sauce, whipped up some fresh cream, and topped it with a cherry. After the first bit I could see why this dessert became popular. It was delicious! 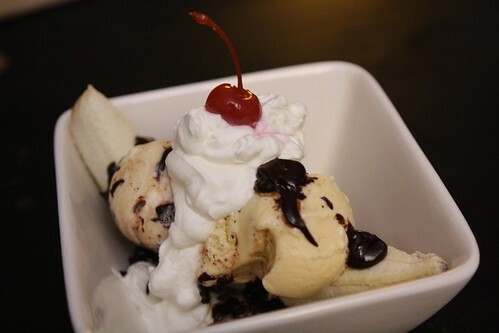 I guess it's not surprising that adding a banana to an ice cream sundae would be delicious. Unfortunately I come to some things later in life. Next thing to cross off my Embarrassingly Admissions of Gen-X Undoneness: watch The Goonies. I know, I know. Save your emails. I am ashamed.